A fine example of traditional artistry, this set of Matryoshka nesting dolls leaves a most pleasant impression on the viewer. Soft watercolors combined with the unique painting and lacquering technique attribute this set of Matryoshka nesting dolls to the best showpieces of any collection of Russian artwork. A lovely young girl, depicted on each Matryoshka nesting doll, wears a traditional kerchief with a festive kokoshnik to adorn her corn-golden hair. The kerchief, a true masterpiece and a real pride of each Matryoshka nesting doll, boasts an exquisite cobalt blue background with luxurious pink roses adorning its back side, rimmed with an aureate ornament. Each Matryoshka nesting doll is holding a bouquet of red flowers, poppies, with an occasional white of a chamomile to set off the scarlet shade of the poppies. These flowers, painted on each Matryoshka nesting doll, have a dual meaning. They signify the promise of resurrection after death and also convey a symbol of remembrance. A poppy is worn to commemorate the victims of war, especially during the weeks preceding Memorial Day. 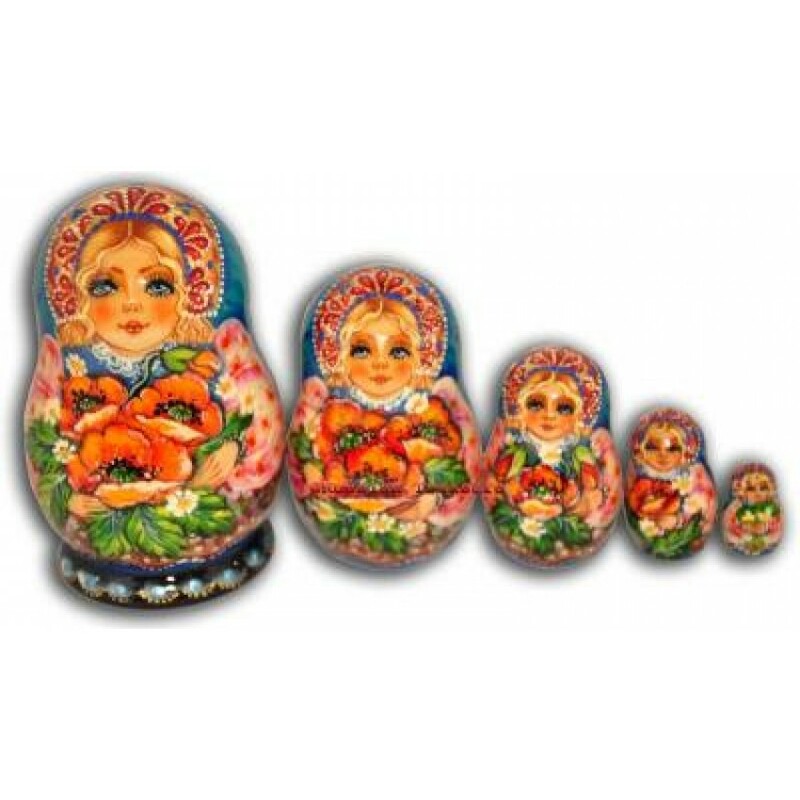 This set of Matryoshka nesting dolls is sure to attract your attention and charm the most special person who would receive it as a birthday gift or a token of love or eternal friendship. Every single piece of artwork is personally selected from the artists that we have worked with for many years to ensure the singularity of representation and uniqueness of the design.